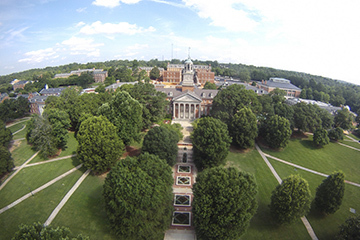 Samford University has selected a collaborative team from Davis Architects of Birmingham, Alabama, and Dober Lidsky Mathey (DLM) of Belmont, Massachusetts, to lead the first update of its campus master plan since the institution relocated to its present site in the 1950s. Five architectural firms from across the nation submitted proposals that were evaluated by a diverse group of faculty and staff serving on the university’s Strategic Priorities and Space Planning Committee. Three finalists were invited to campus to interview with the members of the committee, university administrators, and Samford trustees who serve on the governing board’s Operations and Planning Committee. “As we wrap up the selection phase and move forward, I am very comfortable that we met these objects. The firms that submitted proposals were truly first rate; the work that was presented outstanding,” he added. Members of the selection committee observed DLM provides an exceptionally deep resume of collegiate master planning experience and has worked with institutions in almost all 50 states including Emory, Southern Methodist, Harvard, Yale and Stanford universities. Davis Architects developed the initial master plan for Samford’s campus and has designed many of its buildings; most recently, Cooney Hall for the Brock School of Business. The Davis/DLM team held initial meetings with university administrators on Oct. 13. Development of the updated plan will take several months and involve input from employees, students, parents and alumni. The new campus master plan will be completed in 2016 and will be foundational in planning for the university’s next fundraising campaign. Michael Morgan is assistant to the president at Samford University.